I have a confession – until recently, I didn’t like quinoa very much. Gasp! I hope this doesn’t ruin my credibility as a healthy(ish) food blogger. I guess I tend to prefer heartier grains and felt that quinoa was kind of….bland. However, a recipe for a quinoa/rice/veggie bowl in last month’s issue of Food & Wine caught my eye and put quinoa in my head. 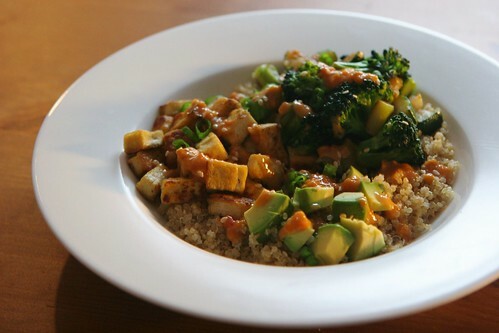 I tossed some ideas around for a while, and eventually decided to combine quinoa with toasted coconut, add some zucchini, broccoli, and tofu, and drizzle with a peanut-miso sauce. A little avocado on top made the dish complete, at least in my avocado-obsessed mind. I loved this healthy meal, and something about quinoa in this context just worked well for me. I’m definitely opening up to the idea of cooking with quinoa more often now! What is your favorite quinoa recipe? Feel free to use whatever veggies you prefer. I think some greens, like kale or spinach, would be nice. Preheat oven to 350 deg F. Spread coconut on a baking sheet and toast in the preheated oven until browned and fragrant, about 7 minutes total, turning pan halfway through. Bring 2 cups of water to a boil in a 2 quart pot. Stir in quinoa, cover pot, and simmer over medium heat and until water is absorbed, about 12 minutes. Remove pot from heat, fluff quinoa, then let quinoa sit in the covered pot for 15 minutes. Stir toasted coconut into quinoa. While quinoa cooks, heat a splash of oil in a large skillet or wok over high heat. When oil is very hot, add tofu cubes. Cook, tossing occasionally, until tofu is well browned, about 12-15 minutes. Transfer tofu to a bowl and add an additional splash of oil to the skillet. Add vegetables and cook, tossing occasionally, until vegetables are crisp-tender and browned in spots, about 7 minutes. Add garlic and cook for 1 minute, stirring. Remove pan from heat and salt vegetables to taste. Stir together peanut butter, miso, maple syrup, and sambal oelek. Thin sauce with about 4 tbs warm water. Taste and add more sambal oelek if you want more heat. 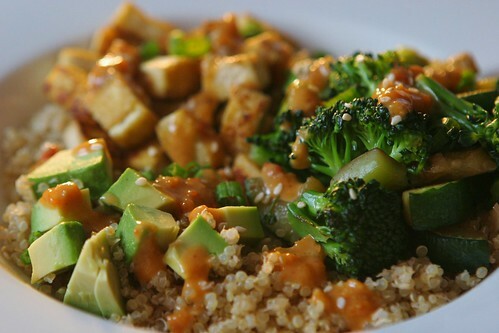 Divide quinoa, veggies, and tofu among 4 bowls. Drizzle about 1 1/2 tbs sauce over each bowl (you might have some extra sauce). If desired, top with avocado, green onion, and toasted sesame seeds. The components of this recipe can be prepared in advance and stored in the fridge for a few days (keep sauce stored separately until just before serving). *To press tofu, cut the block into a few even slices. Lay the slices down on a triple layer of paper towels and top with another triple layer of paper towels. Put a cutting board on top and place a heavy weight on top of that (I use a cast iron skillet). Press the tofu for at least 30 minutes and up to several hours. Pressing the tofu is not strictly necessary for this recipe, but it will really improve the texture. I really go back and forth with quinoa...some days I think it's the best thing other and other days it just doesn't fill me up. But with this peanut-miso sauce...serious winner of a recipe, right here! you put peanut sauce on anything and i'd like it :) i loved quinoa when i first had it, but it hasn't been my go-to of late. It did add a delicious crunch to a granola recently though! this looks great! I got started with quinoa by using it in salads (usually with some corn, red pepper, and a good vinaigrette), but am just starting to experiment with hot quinoa dishes. I agree it can be a little bland on its own. I can't wait to try it with this peanut sauce though! Can you believe it I have never tried quinoa! I love the flavors you have incorporated in this salad and makes me want to try it even more than before! Just found your blog and I am now your newest follower! My favorite quinoa recipe? I add toasted pine nuts and currents, some sauteed garlic and olive oil.... YUM. Hi Tracy - thanks for following! Love the idea of adding currents to quinoa. I'll have to try that. mmm...I love tofu in dishes like this! I have never eaten quinoa before. This sounds super healthy and sounds delicious. I love avocados. I made this last night and it was AMAZING. Miso, peanut butter, quinoa, tofu! All of my faves! Copyright 2010-2012 Ranjani Paradise. Powered by Blogger.